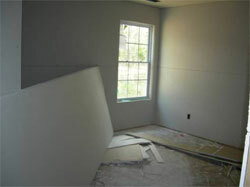 The Drywall process is where the inside of the house takes a significantly more completed form. The drywall, or sheetrock is an engineered product that replaced plaster as the most common interior surface. It is basically compressed Gypsum (similar to talcum or baby powder) in-between two sheets of thick kraft paper. These sheets come in various sizes, notably 4ft x 12ft sheets that are used in our Ryland home. There has been some controversy lately over imported drywall releasing fumes that cause health issues as well as corrode copper. Ryland's contractor used made in the USA� Sheetrock Brand materials from the US Gypsum Company. Though there may be no issues with the foreign manufactured stuff, we feel not only safer with this drywall, but some pride as well. The drywall process can take days to weeks, depending on how complex your structure is. Step one of this process, noted in pictures above involve cutting the drywall pieces to shape to cover every surface that requires it from walls to ceilings. It is typically cut by scoring it with a knife and fracturing it, or the use of a drill with a hole saw or rotary tool like the Roto-zip. The drywall is cut for windows, doors and outlets throughout the house with precision. It is then attached with Nails or Screws to the studs, typically every 12-18 inches. Areas that are prone to moisture, like the bathtubs and showers use a specialgreencolored drywall board that has an anti-mold agent. There is nothing to deny that home construction entails ample amounts of a person's funds simply because there is a need to spend for all of the materials needed and also, to allot funds intended for a repair service. Indeed, everyone would love to have the opportunity and the means to do home improvements and repairs as these help in maintaining the living space and making it durable enough to stay in good shape for many years. A home should be well kept at all times and apart from cleaning it on a regular basis, you should also pay attention to areas where repairs are needed. There is a common notion that any home restoration project can be very costly, but if you know what to do and what you need, you can definitely set aside the right amount of funds for this area. There are contractors that offer services in making the repairs for your home but if this would be too much, you can be the ones to personally handle the repair work. You can personally look for the materials and items that you need and by all means, you can utilize your own devices and tools in doing the restoration project. Making your walls look as good as new can involve the use of new wall paper, wood, and panelling. In order to avoid spending too much on these materials, you can make use of drywall as an alternative. This product has definitely gained popularity in the market over the years because it is noted as one of the cheapest materials to use for home construction; it is made of durable components gypsum and paper. Although sheetrock is cost effective, it is prone to different types of damage. Apart from these factors, this product is also classified as a safety material because it gives a layer of protection from fire and prevents the fire from spreading rapidly in other areas of the house. Certainly, there are numerous benefits that can be obtained with the use of such material and it also brings value for your money. Moving forward, in order to help you manage your funds for the repair, here are seven useful tips that will allow you to save money with the use of this product. 1. Visit hardware stores within your location and shop around for brands and prices; compare the rates together with the quality to see what fits your budget. 2. Ask your local hardware store about the best product that can be recommended for your construction jobs and if there are any alternative materials available. 3. Try to ask if there are discounts offered by retailers intended for the product. 4. Browse the internet and search to see if there are any deals being offered by retailers online as well. 5. Instead of paying a professional to construct and finish the product, you can install the product by yourself with the use of your own tools. Do not forget to ask the retailer to provide you with instructions so that you can have a guideline during the course of installation. 6. You can also ask the help of a family member or a friend in putting up the material on the walls. 7. Check the tools that you need; if you have enough drywall screws, drywall tapes, or nails at home, then you do not need to spend on these anymore. Hopefully these 7 drywall tips will help you save money, not only now but in the future as well.